Jurassic World 2 is currently filming in London, with some filming scheduled to take place in Hawaii later on in production. According to producer Frank Marshall, the movie is at the halfway point, at least in terms of shooting, and to honor the occasion, he has shared a brand new, behind-the-scenes photo from the set. And it looks like there is going to be at least one, brand new dinosaur added to the Jurassic Park franchise that will appear on screen Jurassic World 2. This latest set photo from Frank Marshall was posted to his Twitter account and shows several of the producer's chairs, which are pretty uninteresting on their own. But it is what we can see in the background of the photo that should have Jurassic Park fans pretty excited. While not totally clear what dinosaur it is, there is a full body, practical dinosaur on the set, which is being kept behind some glass in the background behind the chairs. What is clear is that this is a dinosaur that has not been seen in a previous Jurassic Park movie and, since it is in this photo, we can safely assume it will be showing up in Jurassic World 2. Here is the caption Frank Marshall provided on Twitter to go along with the new photo. "Almost at the halfway point... @JurassicWorld #JurassicWorld2"
It wasn't made clear what species of dinosaur is seen in this photo, but the folks at the fan site Jurassic Outpost speculate that it could be a Metriacanthosaurus. Though we haven't actually seen that particular species in any of the previous movies before, that was one of the species that was listed on the embryo storage containers in the original Jurassic Park. In addition to the unidentified, new dinosaur, there are also some other dinos featured in the reflection on the glass in the photo. In the bottom left-hand corner, there is a reflection of what looks to the be a T-Rex. 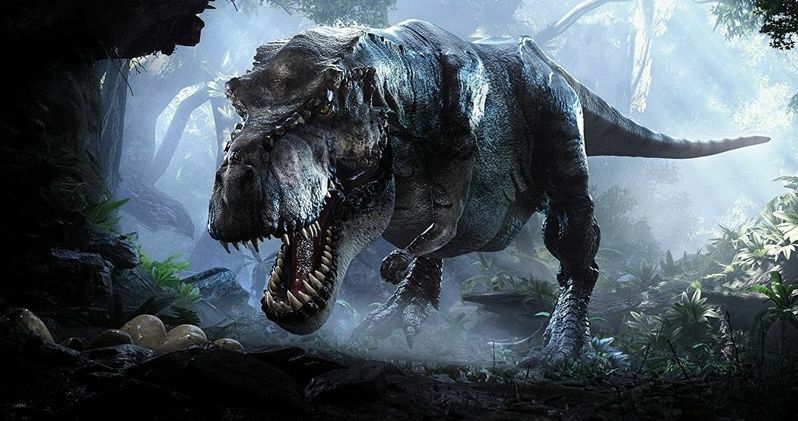 It has already been confirmed by writer/producer Colin Trevorrow that the original T-Rex, who many fans have taken to calling "Rexy," will be appearing in the movie. So that could be what we are seeing. Official plot details are being kept under wraps for Jurassic World 2, but this set photo does provide some more evidence that this movie will be dealing more in practical effects, as opposed to relying almost entirely on CGI. That was a complaint many had with Jurassic World, since there was only one scene that featured a practical effect. Director J.A. Bayona, who is taking over for Colin Trevorrow this time around, shared a set photo recently that showcased a large crew of puppeteers who were on set to operate an unknown dinosaur, so it is clear that there will be a more balanced blend of practical and digital effects in this movie. Chris Pratt, Bryce Dallas Howard and B.D. Wong will be returning for this installment, but there will be quite a few new cast members coming on board. Rafe Spall, Toby Jones, Daniella Pineda, Geraldine Chaplin, James Cromwell and Ted Levine have all been added to the cast this time around. Jurassic World 2 is set to hit theaters on June 22, 2018. You can check out the brand new set photo from producer Frank Marshall for yourself below.